Sometimes it’s hard to get out the paints. I know that for some parents is comes pretty naturally and breathes life. For others, it is more of a stretch to take out the craft supplies. While I don’t necessarily think that parents that aren’t “crafters” need to become crafters to be a good parent, I do think it is great to expose your kids to different things to explore their potential interests. It’s good to expose your kids to sports, art, music, the outdoors and literature (just to get the list started) so that they can explore life and all it has to offer. 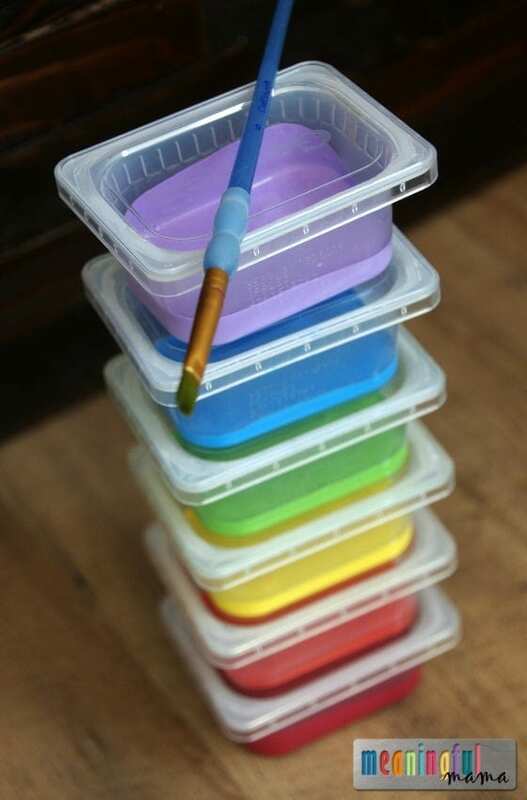 For all parents willing to get the paint out for their kids, I have a fun mom hack for you today: Store paint in baby food containers. My sister-in-law came up with this parenting hack and passed it on to me. She has a baby and a toddler. She saved some Gerber baby food containers for me so that I could experience the wonder and convenience of these little tubs. I have loads of acrylic craft paints. I think it’s great to have these on hand for a variety of projects. I am a mom who likes to get out the paints. You have seen some of the crafts we have done with paints including: egg carton flower prints, toilet paper roll train, fingerprint cross and our garden butterfly wands. I have to be in the right mood, but I’ve tried to organize our craft closet and do simple tips like the ones found here to make crafting more accessible. I believe the crafting tip to store paint in baby food containers is one more way of making crafting more do-able. Why is this a better way to store paints? There is Not as Much Paint Waste – If you squeeze out craft paint into a cup or paper plate like I was doing, the extra paint is discarded. 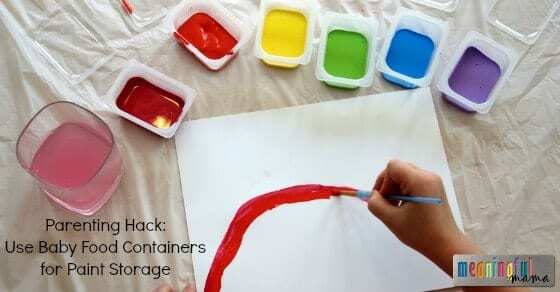 With this storage container, you don’t have to waste the unused paint. The Lid Keeps the Paint Fresh – The next time you go to use your paints, they will have stayed fresh because of the snap on lid. You are Up-cycling – Rather than tossing all of your baby food containers, you are finding another use, which is better for our environment. You Don’t Need to Buy a Special Product – You can spend your money on products like these no-spill paint cups. They are pretty cool. That said, not everyone has that luxury. It’s wise to watch your budget. Re-using baby food containers is a great money-saving solution. You could use the little baby food jars for this purpose too. Easy Clean-Up When Needed – It’s easy to clean up because lids just snap on and put away. 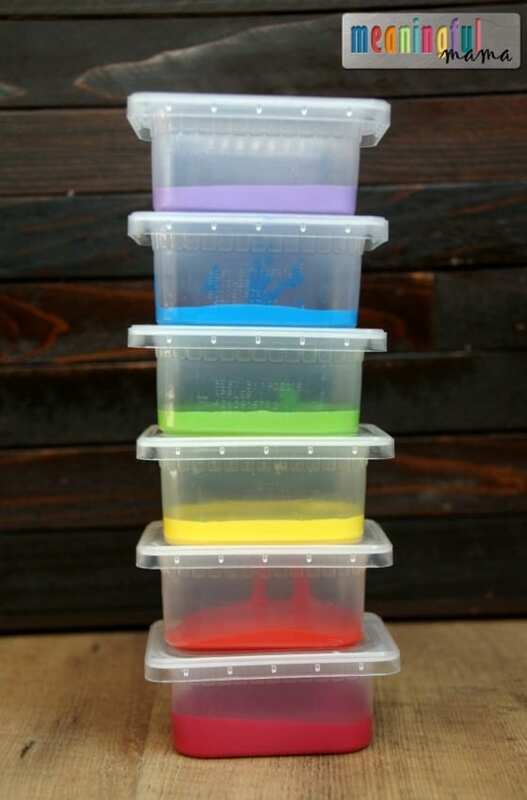 When the paint is all used up you can wash it out and use it again or you can decide it’s just time to throw away and use one of the other containers like this you have in your home. As a mom, I know that I weigh whether I want to do something with the kids based on the mess it will produce. This seems like a win into paining world. I hope this parenting and crafting hack inspires more creativity in your home.